OilSoup: Oilers Obtain Nick Shultz for Tom Gilbert! Oilers Obtain Nick Shultz for Tom Gilbert! You heard it Oiler fans. Steve Tambellini traded five year veteran Tom Gilbert for Nick Schultz of the Minnesota Wild. The trade occurred only a few hours ago and Oiler diehards are not happy. It's been a tough year for Oiler fans; the team is struggling, players injured, and a GM who does nothing. Trade deadline has come and gone and the team is no better. Only one deal was made and it's a deal that no one seems to like. Tom Gilbert is gone. A player who has become a fan favourite this year. 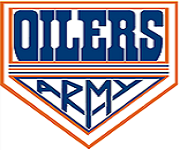 It was only last year that Oiler fans we're throwing poor Gilbert under the bus and now they're angry he's gone. Sports fans can be so fickle. The Oilers will miss his puck moving skills and his leadership on the ice. He is a player that you notice the second he steps on the ice. The type of player that Nick Schultz is not. I've only had the chance to watch Schultz play a few times, but he is exactly what is missing on the Oiler blueline. Nick is as tough as they come. Not all that surprising considering he's a Saskatchewan boy. He's not a fighter but he can fight. I guarantee you that if some one touches one of our young stars, Schultz will be there. Nick is a shutdown defenseman who can skate and play physical. The Oilers have added a little more sandpaper and a little more stability. Something that has been missing since the departure of Jason Smith. Stable was something that Gilbert was not. Tom is a natural offensive defenseman who was forced into a role of a shutdown defenseman. He did an admirable job, but it's not what he is. With the unloading of Marek Zidlicky, the Wild were in a need of an offensive defenseman. Gilbert will now see top minutes on the powerplay instead of limited time with the Oilers. In a way it was a position of strength, because the Oilers have one of the best powerplays in the league. Gilbert was valuable, yet expendable. Schultz on the other hand will bring dependability to the defense. He`s a top pairing penalty killer that will make the Oilers special teams one of the best in the game. The Oilers are neither younger or older. The contracts are nearly the same. A defenseman for a defenseman. Is the team any different? You bet it is! I love this trade and in time Oiler fans will too! Goodbye and good luck Tom Gilbert, and welcome Nick Schultz! Fewer mistakes in our own zone should give the Oilers a better chance of winning those close games.